Bring your items to the Kitsap Sun Pavilion. Check in with your completed Consignor Waiver at the front table. We provide you with a shopping cart to help you bring your items inside. You will also receive a Drop-off Map showing you where to place your items on the floor. Our volunteers are there to answer any questions you might have! You'll receive you checks electronically no later than 3 weeks from the close of the sale. 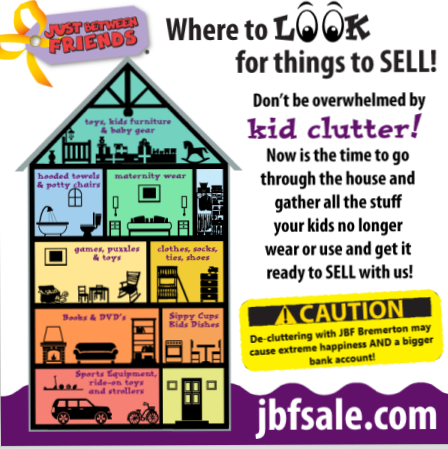 JBF Bremerton Consignors earn an average of over $380 at each sale and you can TOO! Consignors who help at the event can shop even earlier, earn 70% on their sold items, and/or have their consignor fee waived. An $18.00 Consignor fee is taken out of your check, with no upfront costs to participate. Save money by prepaying or waiving your entirely. Details are in the consignor agreement. Don't delay! Learn the tricks of the trade by attending one of our Consignor Workshops with one or more of our TOP SELLERS. Team Members who complete a total of 4 hours get to shop MUCH earlier, 8+ hours earns 70% on their sold items and 12+ hours gets the consignor fee waived! Shop EARLY at Wednesday's Presale, your shopping time is earlier, the more hours you help at the sale! Shop EARLY at Saturday's Half-Price Presale and Volunteer Appreciation Event. Our crew helps with everything from event set up, inspection, organizing merchandise, helping shoppers, running the point of sale system and breaking down the event. 1. Prep, price and organize your items at home (see details below) and bring to drop off ready to be SOLD! Need a Drop-off Map to help organize your items at home? 2. Check in with your Consignor Waiver and we will provide you with a shopping cart to help transport your items into the building and a map to show you where your items go. Check out our Drop off video HERE. If you are selling a car seat, booster or base, a Car Seat Waiver is also required. 3. Watch your sales grow with our real-time updates. It is seriously better than winning the lottery! Cha-Ching! 1:00 to 2:00pm | Volunteers with at lease 2 hours helping during sort process, can shop the "LAST CHANCE SALE" 75% off Donated items. Details will be emailed to volunteers. Maternity sizes (NO LIMIT to the number of maternity clothing items per consignor). Our Fall Sale is fall & winter clothing only (what your child would wear between September-March). Be picky. Look at your clothing items as if you were going to purchase them. No stained or damaged items will be accepted. Freshly clean your clothing items. Button all buttons, snap all snaps, zip all zippers before you arrive at drop off. This will ensure that there are no defects in the clothing. The newer the item looks (and the better it smells), the better it will sell. Presentation SELLS. Iron or steam if necessary. Hangers - Please hang clothes so the hanger hook points to the left (like a question mark “?”). Hang size 0-6 clothing on child-size hangers and sizes 7-20 and maternity clothing on adult-size hangers. Clothing that falls off the hanger onto the floor does not sell well. Old Navy and many outlet stores are great places to get free hangers (they throw away hangers daily!) and WalMart & Target sells child-size plastic tube hangers at a great price. Clothing Sets - Sets tend to sell better (under size 6) so match things up if you can. All garments should be hung with the hanger hook pointing left (hanger should resemble a question mark when looking at the front of item). Safety pin to attach clothing sets securely with bottom garment hung on the backside of the shirt, so both pieces can be viewed without separating them. Pants/Shorts - Pant-clip hangers are great but if you use a standard hanger, simply use a good quality safety pin to attach pants to the top part of the hanger so the garment will not slide. Onesies, socks, tights, hats and infant mittens need to be in a clear zip-lock bag (you may group multiple items in one bag). Label your tag well so that customers know if the items are short-sleeve onesies or long-sleeve onesies. PRICE: Hanging Clothing - Put outfits/set together to price for at about $3.00; Start at $3 for basic, generic brand 0-24mo outfit. Add $1 each for larger size, name brand, formal, and heavy/winter. Non-hanging Clothing - Put sets together to price for at least $3.00, but okay to price for less (i.e., 6 pair of socks for $1.50). And it is ok to price higher. TAG: Clothing on Hangers - Attach tag with a tagging gun or quality safety pin to the label of shirt or upper right front of pants. Insert the gun in a label or inside seam NOT through part of the clothing (to avoid making a hole or tear in the clothing). Also, pull on the tag to make sure it is properly secured and will not come off easily. Please make sure consignor tags are pulled out of the clothing so they are easily visible to the customers. PACKAGE: If item has multiple pieces use packaging tape, tagging gun, safety pins or clear self-seal bags to keep items attached together and clearly visible to shoppers. Batteries must be included, if applicable. If your item is pulled for lack of batteries, your account will be charged $1 per battery. GATHER: Diaper bags, infant carriers, backpacks, and purses are great consignment items. Please inspect all items carefully to make sure items have not been recalled, stained, damaged or are missing pieces. We do accept breast pumps; please be aware that many people are getting them for free now through insurance, so price accordingly, if you want them to sell. Pump accessories are okay to sell. Test to make sure that toys and equipment are working properly. Battery operated toys must include working batteries (these can be purchased inexpensively at local discount stores). If we pull an item and have to put batteries in, consignor will be charged $1 per battery needed. Shoes must be current season (Fall = September thru March; Spring = April thru September). Bedding sizes accepted are bassinet through FULL/DOUBLE only. Please be selective when selling bedding, blankets, receiving blankets, burp cloths, and towels. New and barely used items sell best. Check carefully for stains; shoppers get very disappointed if they find a stain in a bundled blanket once they get home. PACKAGE: Put bedding/crib/bedroom sets together in original packaging or in giant clear plastic bags. Arrange bedding sets inside bag so that shoppers can see all of the items as well as the design/pattern. Secure the bag so that items do not get separated. Bundle blankets, cloths, and towels with ribbon or string like a package (be sure multiple pieces cannot be separated). You can also fold and safety pin to hold together. TAG: If bedding is in a plastic bag, attach tag securely with packaging tape to the inside of the bag and tape the bag shut (bedding set prices vary widely and securing tags inside bags prevents tag switching). GATHER: Books, book sets, board games, puzzles, video games, video game systems, scrapbook, arts & crafts sets are great items for resale. Please only bring kids’, parenting, homeschooling, pregnancy and child rearing books. Check items to ensure they are in great condition. Be sure that parts/games to video game systems (such as Vtech) cannot be separated or switched out at the sale. Video games can be in a locked cabinet near checkout to prevent theft. If you would like a high-priced item placed in the High Value Cabinet near Checkout, please see a volunteer during Drop Off. TAG: When tagging books, please attach your tag to the book with painters tape that can be removed without damaging the item. Tape tag to the outside cover of books where it will NOT easily tear when removing the tag. Please do not use masking, packing or double sided tape. Hole-punch JBF tag and tie to sets. GATHER: Exersaucers, swings, high chairs, changing tables, cribs (Manufactured AFTER June 28, 2011); please bring Crib Waiver for all cribs,cribs, strollers, bath seats, baby walkers, car seats & car seat accessories must be checked for safety recalls . All parts and must have all parts, and be in good condition. Children's furniture - beds (toddler, twin), desks, side tables, dressers, etc. Household furniture - please see Mommy Mart information below. Children's furniture - beds (toddler, twin, full/double), desks, side tables, dressers, etc. All furniture and equipment must be assembled during the sale. Batteries must be included, if applicable. If we have to put in a battery, you are charged $1 per battery. TAG: Attach JBF tag directly to item with clear packaging tape or hole-punch JBF tag and tie it to item. We will have Yellow Large Claim Tags at Dropoff. Household items that other families will use, think GIFTABLE. This is not a garage sale, please be sure these items are in excellent shape. You may consign storage solutions (baskets, bin, shelving), furniture, decor (lamps, wall hangings), and kitchen items (small appliances, utensils, etc.). Please Note: For this category, donations for Mommy Mart will be donated to a non-profit that can use these items. Currently, this is the S.A.F.E. Thrift for Peninsula School District that funds local scholarships for needy teens. Too busy to tag? Moving away? Won't be here for the sale? We have Top Sellinglocal mom taggers trained to help you! We prep your items and you earn 45-55% cash! VIP Consignor spaces are limited and will close when spaces fill—and they DO fill quickly! If VIP Tagging were not an option, would it be impossible for you to participate in the next JBF sale event? Our VIP Coordinator, Jodee will contact you with confirmation and connect you with your assigned Tagger. Print the VIP Consignor Agreement and bring with you to your appt. Click to see the list: * COMING SOON! There are several optional classes leading up to the event. In just a few hours, you will know exactly how to prep, price and tag your items. Stay tuned to your email for dates and times. Don't have a printer? Let us know. We will help you find a solution. If you need children's hangers, cardstock, safety pins, or zippered bags we've got you covered! See details to below to purchase supplies. You can make it a one stop shop and at the best prices too! To place your order, please click here and you will be taken to our Supply Order Form with secure prepay optiont! We also host supply pick ups during the weeks leading up to the sale. Please inquire on the Consignor Facebook Group. We are SUPER excited to announce our consignor referral program!! You may have already consigned with us, or you're a new consignor yourself!! You already KNOW kids keep growing and growing and so do your friend's kids! Help them turn their closet clutter into cash! and put $$$ in your pockets too! Invite them to consign WITH you! It's simple.... Share the JBF LOVE and YOU get rewarded! It’s a WIN-WIN for you and it’s a win for the community! We want to say THANK YOU for helping us help our community!